The kitchen by Quique Dacosta is characterised by combining creativity and gastronomy, and since last year, at his restaurant the “Studio de Creatividad” (Creativity Studio) experience can be enjoyed, created with the aim of combining signature cuisine and the discovery of new flavours. It is a laboratory within the kitchen itself, where the chef maintains contact with visitors, who can enjoy the culinary art of 3 Michelin star chef Quique Dacosta. The Studio de Creatividad arises from the “Dacosta landscapes” concept of gastronomy, through which the chef expands his area of action to tables, ceilings and walls. The idea is to combine objects until the borders between space, function and decoration are eliminated. 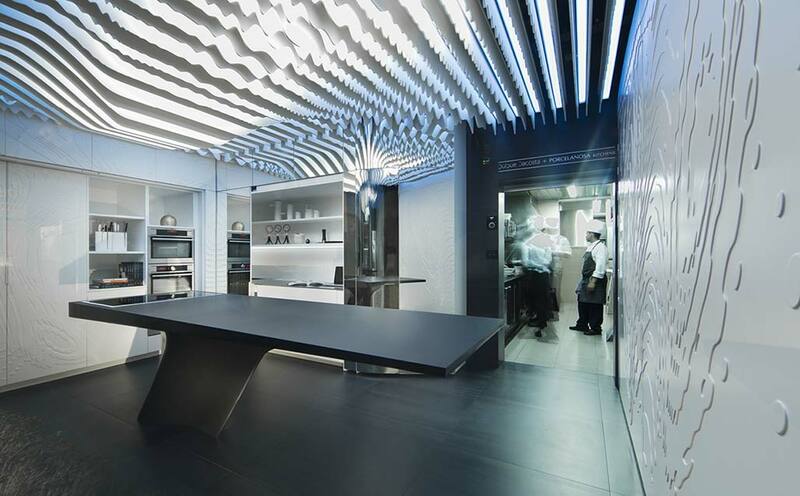 This is where Porcelanosa Kitchens (Gamadecor) appears, taking on the challenge from Quique Dacosta, creating the kitchen designed by the chef. Within the Creative Studio, the central island is notable, with a monolithic form created with KRION® 6901 Black Metal. One of its sides is equipped with a cooking area that allows dishes to be prepared in front of diners. The columns and walls are created with KRION® 1100 Snow White, decorated with milled low relief forms on the material. The spectacular ceiling is also created with the Solid Surface from PORCELANOSA Group, through a system of strips made with KRION®, like the kitchen bench which also incorporates this material. Thanks to the collaboration between Quique Dacosta and PORCELANOSA Kitchens, KRION® has become a point of connection, providing continuity and an impressive effect of fluidity, in an environment which allows the innovations from the creative mind of the Chef.